Want to wow your guests this party (and every) party season? Serve them this smoked salmon pizza! This is a staple at our Christmas brunch, and whenever we have reason to celebrate. But be careful! Be sure to grab yourself a piece, because once served, this hors d'oeuvre disappears fast!! Bake pizza crust as per instructions on dough and let cool completely on a cooling rack. Mix cream cheese and onions in a medium sized bowl using a spatula or wooden spoon. Spread over cooled pizza crust. Place salmon over cream cheese mixture and sprinkle with dill. Cut into slices and serve! Wishing everyone a wonderful holiday season! It's hard to believe the new year is upon us! Do you make a resolution? More travel, macarons, and pilates perhaps?? Bake Me a Christmas - New take on "traditional Christmas flavors"
As all of us plan our Christmas menus, traditional flavors such as gingerbread, peppermint and eggnog usually ride high on the list. But what came first, the favorite flavor or the tradition? My guess is the favorite flavor, and for that reason, I'm serving chocolate oreo cupcakes with white chocolate oreo buttercream frosting. It's quite a mouthful to say, but pop one in your mouth, and you'll have a mouthful of Christmas deliciousness that will put you in the holiday spirit! Triple Chocolate Christmas Cookie RECIPE! This recipe is full of chocolately holiday goodness in every bite! 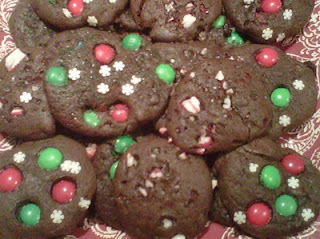 Even better: since it is a drop cookie, little baking technique is required, which makes this super kid-friendly! Mix ingredients in a large bowl using an electric mixer until well combined. Using two teaspoons, spoon batter onto 2 baking sheets, covered with a Silpat liner. Top with first layer of toppings. Bake for 6 minutes. Add more of the desired topping and place back into oven for another 6-7 minutes. Transfer to cooling racks, pour yourself a nice glass of milk and enjoy! Makes about 48. This a uber-handy tool that makes life a lot easier! It is a professional quality zester that works with hard cheeses, or lemon and lime zest. You can also use it for grating chocolate or garlic and ginger. A microplane is also a great tool to have when grating fresh nutmeg! It is made of surgical grade stainless steel, and features a generous grating surface. Yes, it's dishwasher safe! These are adorable! Who wouldn't want a "cupcake baker" ornament?! Add a whimsy treat to your Christmas tree with these adorable Little Miss cupcake ornaments. Candy Fantasy Little Miss Chef Cupcake Christmas Ornament 5"
Check out the whole brood! What could possibly be better than truffles? they are as delicious as they are easy! 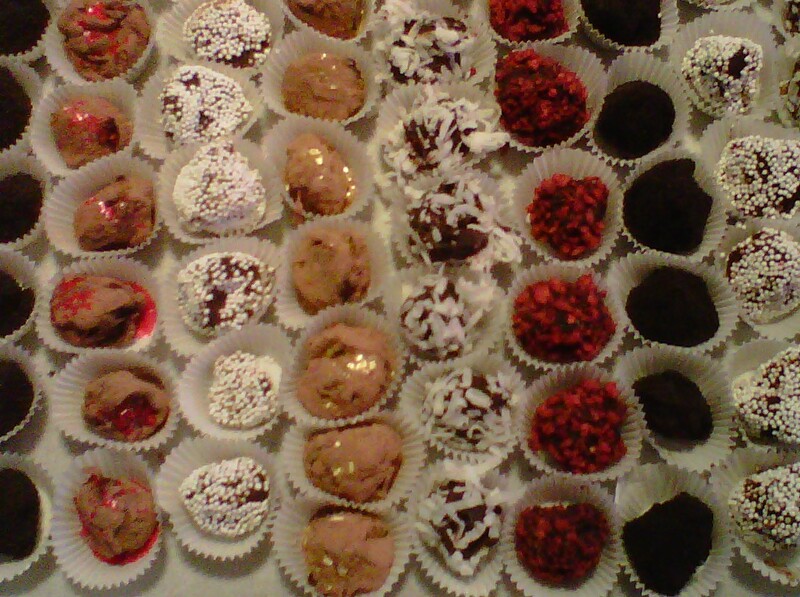 **It's uber important to use a good quality chocolate when making your own truffles. We used Callebaut, which can be found at Premier Gourmet. We decided on the semi-sweet, 51% cocoa chunks. Using a serrated knife, chop the chocolate into uniform sizes. (This helps it melt at the same time!) Place chocolate pieces into a medium/large bowl. After you chop your chocolate, bring 1 cup of heavy whipping cream to a simmer. (Be sure not bring the milk to a boil!) Pour the hot cream over chocolate. Stir the ganache with a wooden spoon until completely smooth and lump-free. Place in refrigerator for about 1 hour, or until firm but still pliable. Using a small melon-baller and teaspoon, scoop out truffle. At this stage, you can either place onto Silpat or parchment paper and use your hands to coat the chocolates, or use the teaspoon to help coat the chocolate in your desired topping. The choice is how "hands-on" you want to be!! To differentiate the two flavors, we topped the pumpkin pie spice truffles with edible gold glitter, and red to the cayenne pepper truffles! BEHIND THE APRON: The sky is the limit when it comes to flavor combinations for your truffles. Why not try mixing peppermint extract to the chocolate and roll your truffles in crushed candy canes?? When I stumbled upon these, I couldn't resist putting them on the wishlist! These vibrant nutcrackers look like they came straight out of the Cupcake Kingdom Nutcrackers hold colorful candy scepters in one hand and wear cupcake hats Embellished with glitter, "frosting", "cherries" and gemstones! We were recently asked what to do if a recipe calls for a double boiler, and you do not have one.... The answer is simple! Use a glass bowl! The bowl must be heat-proof and be big enough to rest atop of the pan. But make sure the water is not filled too high so that it touches the bottom of the bowl! Bake Me a Christmas - Gift idea #3: Hello, Cupcake! Also available: 2011 Wall Calendar! Looking for something festive to do this weekend? Why not a gingerbread house?? While some people prefer to use the store bought walls, try this recipe if you want to make it yourself! Combine wet and dry ingredients with a wooden spoon. Wrap dough in plastic wrap and chill until cool. Flour your countertop. Roll out dough into 1/8 inch thickness. Cut into desired shapes. Bake for 12-15 minutes. This guy is like a successful blind date! It's a hunked up version of the original paddle attachment and you probably didn't know it existed! It scrapes the bowl as you work, eliminating that pesky batter roll up!! PERFECT holiday gift for the woman on your list who loves her Kitchenaid mixer! Click on the link below to order! Looking for inspiration for your gingerbread winter wonderland?? Check out these amazing gingerbread houses from "Gingerbread...Gifts...Glitz... At Gilda's Club" last weekend! 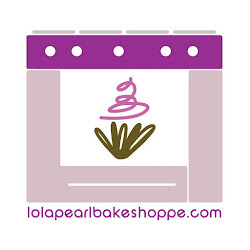 In search of something extra to your cupcakes? This is a great way to show off your skills and gain admiration from your guests! These reindeer cupcakes look so adorable! Using melted chocolate and a ziploc baggie, pipe out antlers (on parchment paper) and add to your chocolate cupcakes for an festive treat! Do you know the Muffin Man? Well, the Muffin Man sleeps in Silpat sheets! 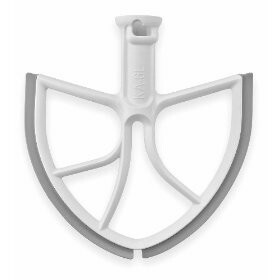 This is a definite must have for all bakers, at every skill level. The non-stick surface helps make everything come out beautifully! In fact, LP recommends this for anyone who uses a baking sheet! Click on the link below to order! BEHIND THE APRON TIP: Reading this and don't have a Silpat yet? Parchment paper works just fine!